Cast: Lucas Black, Nathalie Kelly, Brian Tee, Bow Wow, Brian Goodman. Written and directed by Justin Lin. 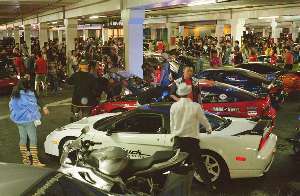 Story: Illegal Japanese street racing. Utterly ludicrous but still cheekily amusing, The Fast and the Furious: Tokyo Drift will either make you laugh or send you to sleep, depending how seriously you take it. Let's face it - if you don't already know what this movie is, you're not going to like it. The Fast and the Furious is a franchise now, this being the third in a series filled with suspiciously pretty drivers in impossibly shiny tricked-up mid-range exotica, performing ludicrous CGI-assisted stunts to an ear-bleedingly loud soundtrack. This time round, it's more of the same, except we have no grinning Paul Walker this time - our rugged hero is now virtual unknown Lucas Blake, who has had relatively small parts in Jarhead and various TV shows. Writer Chris Morgan has latched onto the recent trend for drifting, but the story betrays a fundamental misunderstanding of the subject. 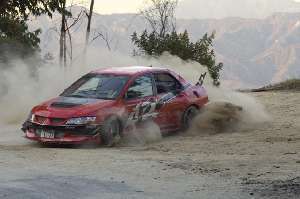 Drifting is about style, not speed, so the idea of "drift racing" is (oxy)moronic. Drifting is like figure skating - no-one cares how quickly you do it, as long as it looks good and you're in complete control. The better your drifting, the slower you are around the track, so to judge a drift race by who crosses the line first completely misses the point. But then, maybe I'm missing the point in mentioning that - this movie, as with its predecessors, is all marshmallows and no meat. As long as your tyres are smoking, it's all good. So what about the tyre-shredding action - is that any good? Well, it's a touch naive even in this context. We still have cars with infinite gears and actors having no idea what to do to make the car do what it's doing on the outside (Nathalie Kelly is particularly awful at this - she's still gazing dead ahead while her car's sliding at 45 degrees), but it's improved massively since the first episode. No longer do we have the current loser of a race suddenly remembering to press the gas pedal and thus magically making up the deficit, and the stunts are at least believable this time, even if some of the grafted-in computer sections contain intrusively unrealistic motion - which is particularly unacceptable as many of the hardest stunts are actually done for real. There's a little more knowledge in there somewhere as well, there's at least one heel-and-toe move in there and I think I even saw someone popping the clutch at one point - though it could have just been a harsh gearchange! Story-wise there's nothing worth waking up for, it's the usual teenage tripe designed to appeal to kids not old enough to drive yet, and the performances are similarly petulant. Lucas Black is a worthy brooding successor to Paul Walker, though he doesn't quite have the same presence and is clearly way too old to be in school (he's 23 and looks it). Brian Tee is instantly forgettable as the junior Yakuza baddie, as in fact are all the supporting characters - I doubt I'll remember anyone except Black in a month's time. The cars are more memorable, if not to my taste - there's a nice selection of Nissan 350Zs and Skylines, Mazda RX7s and RX8s, S2000s and Mitsubishi Evos (not your ideal drifting companion, not that you'd know it here!) - but unfortunately they have to be Max Powered to within an inch of their lives, because that's what the movie men think the image-conscious audience wants. Hell, maybe it is - I'm not exactly sixteen any more. The Fast and the Furious: Tokyo Drift is a painfully shallow cars-for-kids movie with an awful plot, tedious script and banal performances. Yet somehow a vein of cheekiness shines through and makes it fun, despite being dreadful. Far better than the second instalment and much smarter than the original, I'm on my own in thinking this is the best of the lot. Testosterone Satisfaction Rating: 4/5 - fast cars and the occasional scantily clad bimbo - nothing dangerous though. To enjoy this film you should be: able to laugh at it and laugh with it at the same time. Or a Max Power subscriber. The Fast and the Furious: Tokyo Drift was released in the UK on 16th June. 5/5, excellent. I have loved all of them,u never c a good car film.The ending was brilliant there better be another one especially how u c dom at the end back from the1st one.